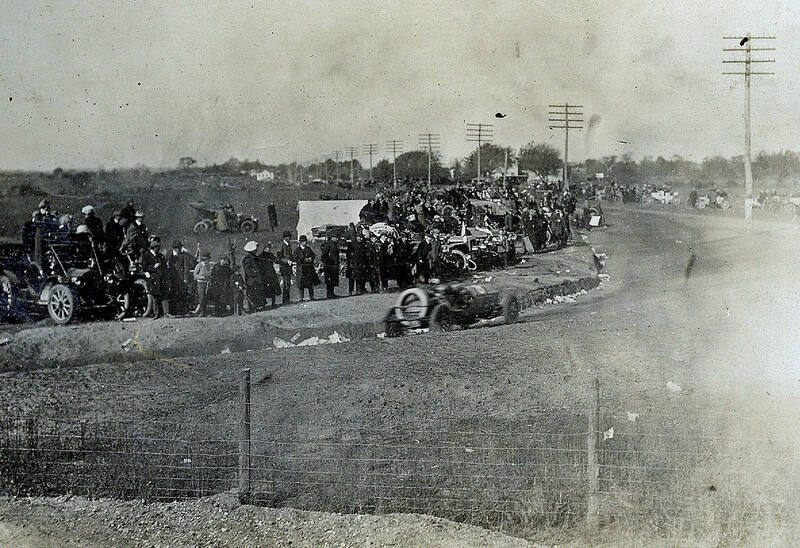 The intersection of Massapequa-Hicksville Road and the Long Island Motor Parkway was a favorite location for watching for watching the 1908, 1909 and 1910 Vanderbilt Cup Races. 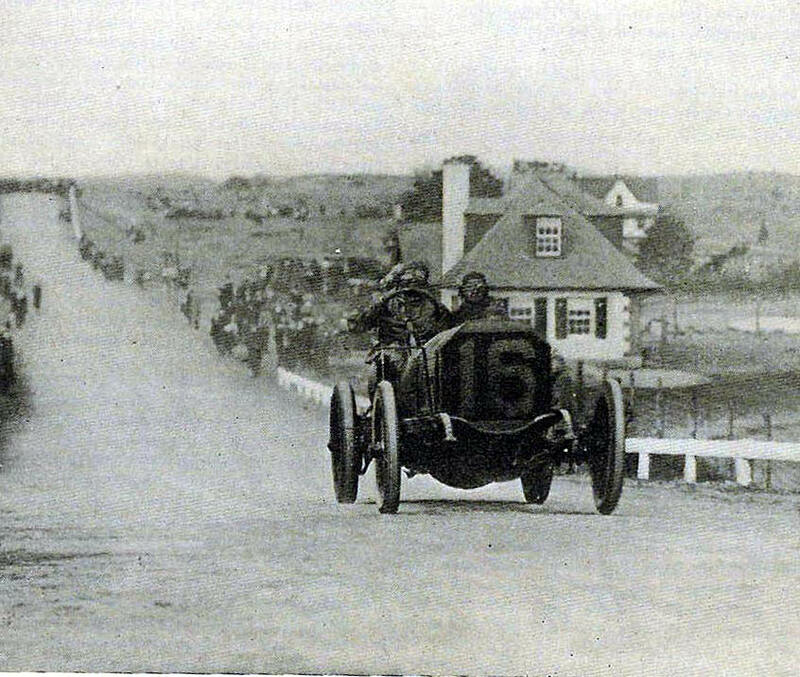 Hard to believe this quiet Bethpage/Plainedge neighborhood (at the edge of the Hempstead Plains) was packed with racing fans over 100 years ago. 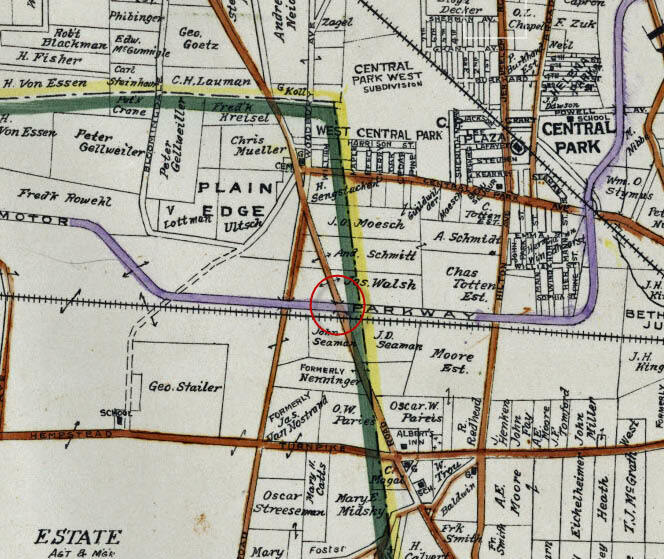 1923 Belcher-Hyde map shows the location of the Motor Parkway bridge over Massapequa-Hicksville Road.. This section of the race was a straight-away challenge between the two Motor Parkway bridges. Looking west, the Wantagh Avenue Motor Parkway Bridge can be seen in the background and the Massapequa Lodge on the right. "Old 16" on it way to winning the race making the climb on to the Massapequa-Hicksville Bridge. 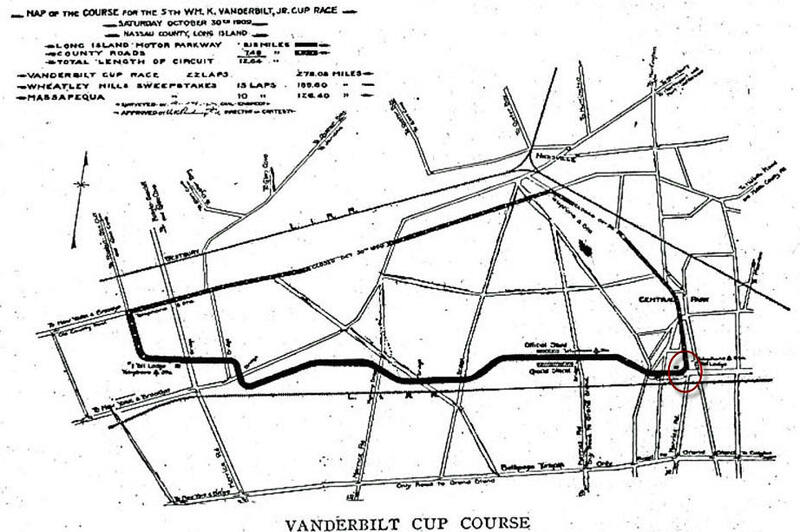 At 12.64 miles, the course for the 1909 and 1910 races was shorter than those for any previous Vanderbilt Cup Race and for the first time did not cross railroad tracks. 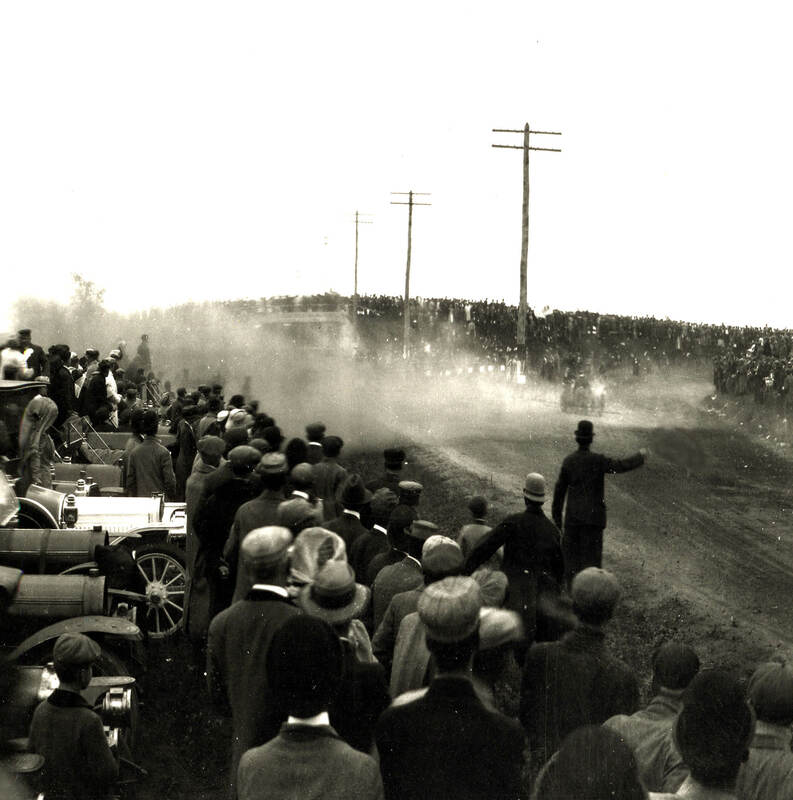 Organizers believed the shorter course would decrease the intervals of time between appearances of cars and also provide more exciting entertainment for spectators. 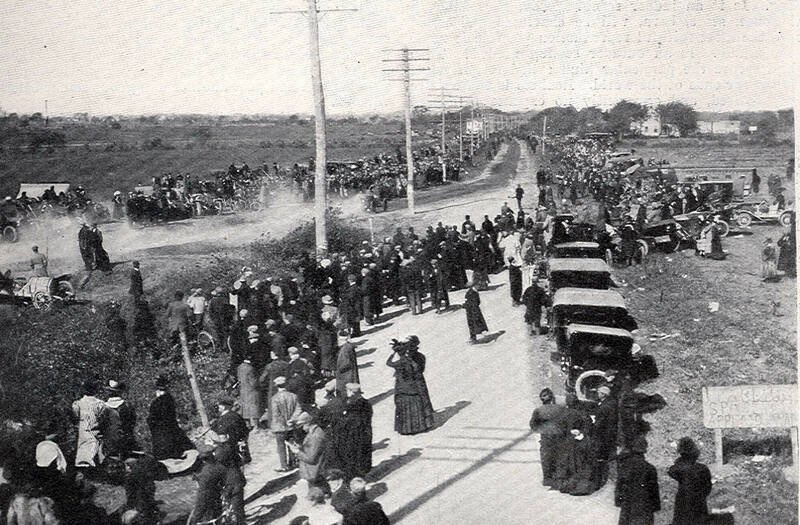 An eighth of a mile past the Wantagh Avenue Bridge, the drivers came to the eastern end of the Motor Parkway section of the course at the Massapequa Lodge. 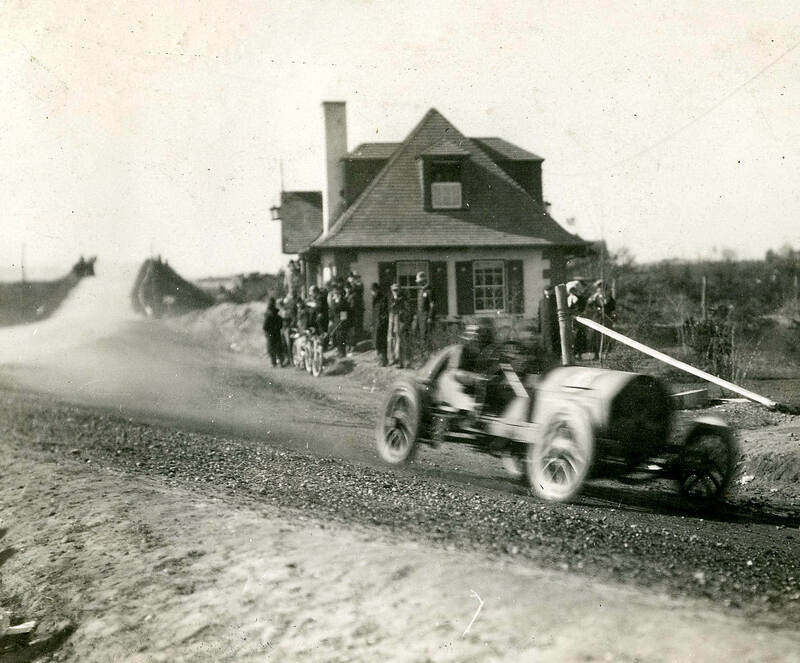 During the race, the racers transitioned from the concrete Motor Parkway onto a temporary crushed stone road just south of the lodge. 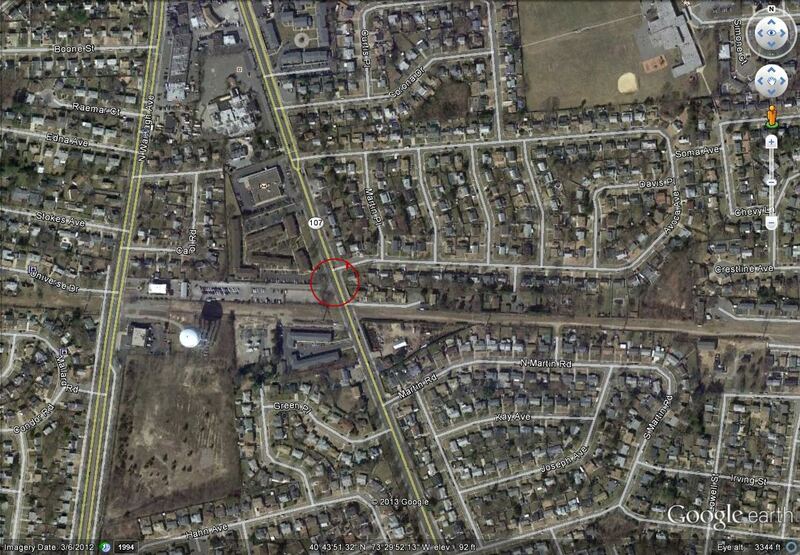 The temporary banked road curved north to connect to Massapequa-Hicksville Road. 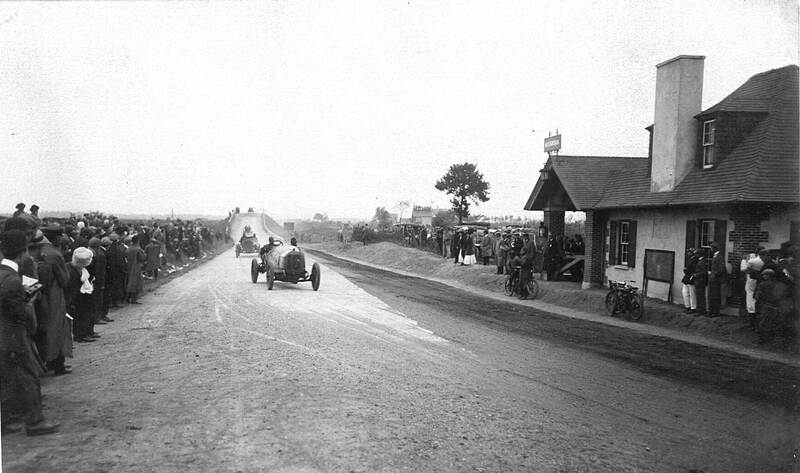 A great view of the Massapequa Lodge during the 1909 race. 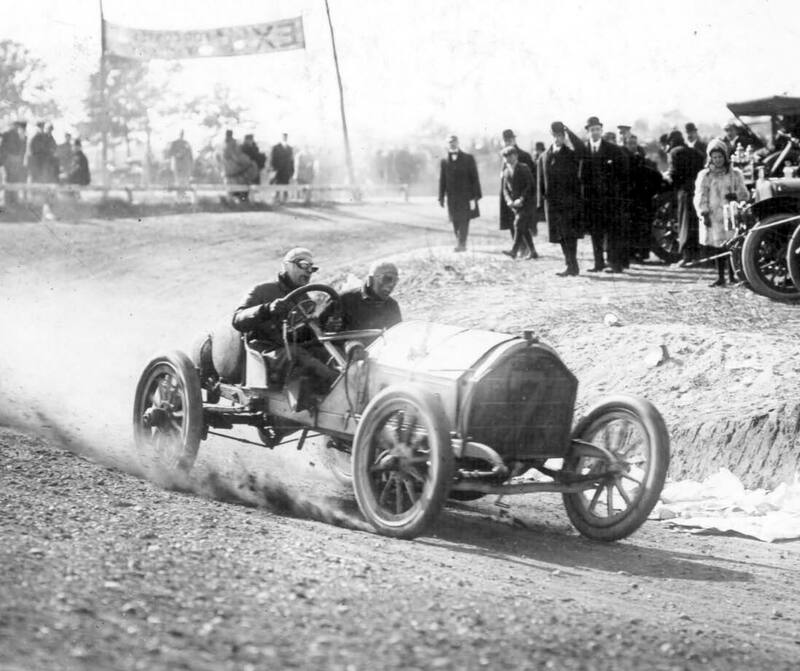 Harry Grant and Frank Lee taking the turn in the Alco Black Beast. 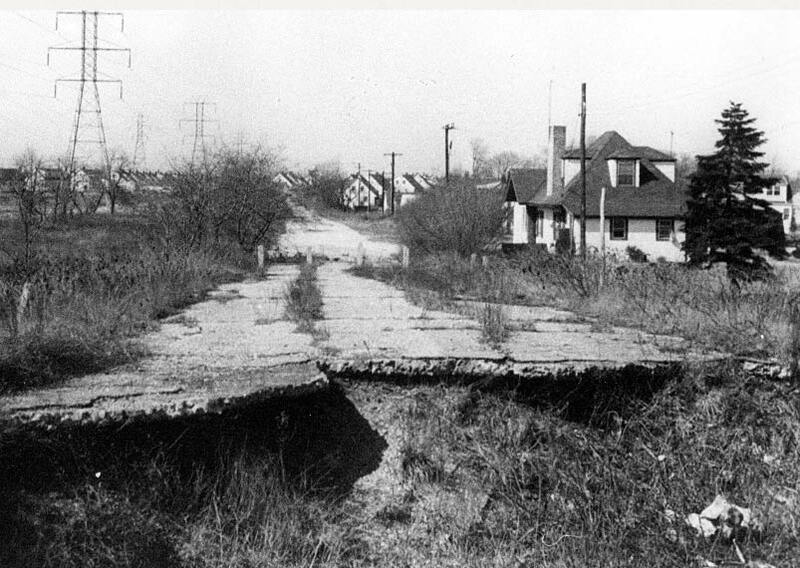 Another view of the Black Beast looking north with Massapequa-Hicksville Road in the background. The race as seen from atop the bridge. Look closely and you can see one car racing on the turn and another stalled on the shoulder of the banked curve. Looking south at the crowd on the Massapequa-Hicksville Motor Parkway Bridge and the turn. 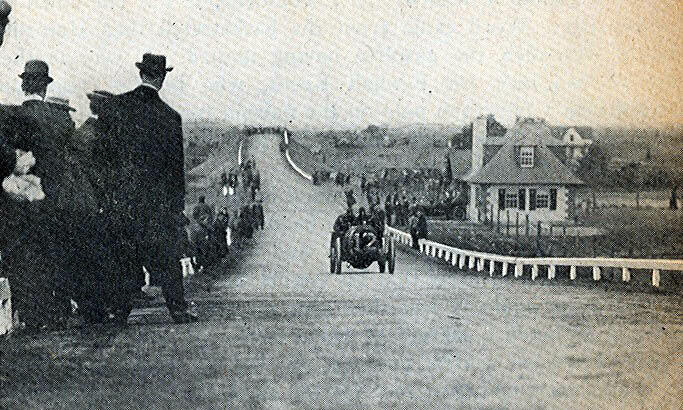 Over 2,000 spectators watched the race here. The #7 Chalmers driven by Bill Knipper taking the turn. 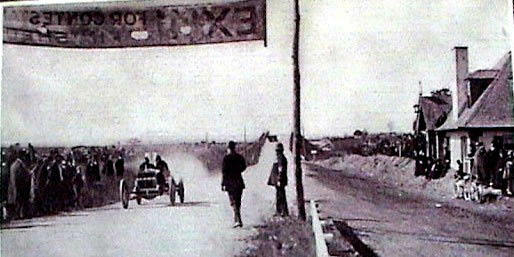 Note the banner in the background across the Motor Parkway. . This racer is leaving the course and continuing on to the Motor Parkway. This image use to be a mystery for me. Why did this car not take the turn? Reversing the copy on the banner reveals "Exit For Contestants" and the answer. 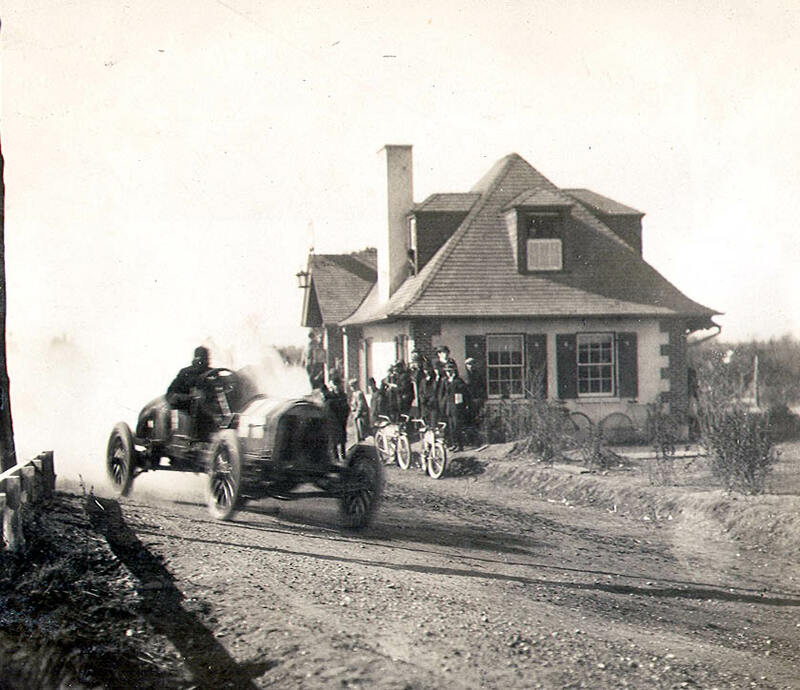 After the racers finished their laps, they were required to continue on the Motor Parkway to the Bethpage Lodge for an inspection. 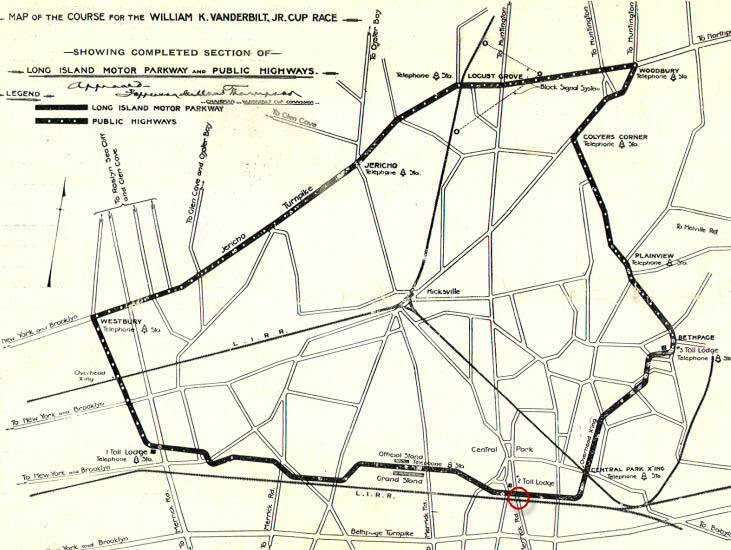 The same course with the Massapequa Turn was used for the 1910 race. 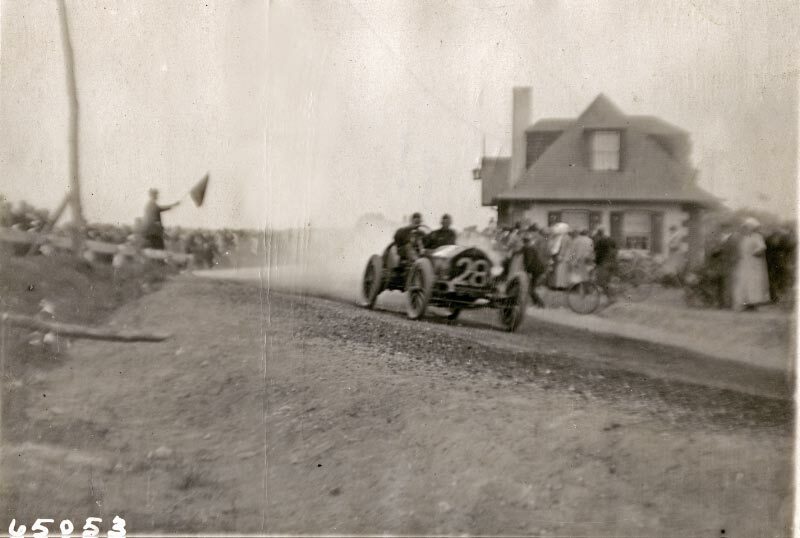 Four racers can be seen in this photo. The smaller course was successful in making the race more exciting, but also making it more dangerous with crowds spread out over a smaller area. By1959. the bridge had been taken down and the lodge abandoned. Photo courtesy of Ron Ridolph. The lodge was demolished in the early 1960s and the site became part of a garden apartment complex. 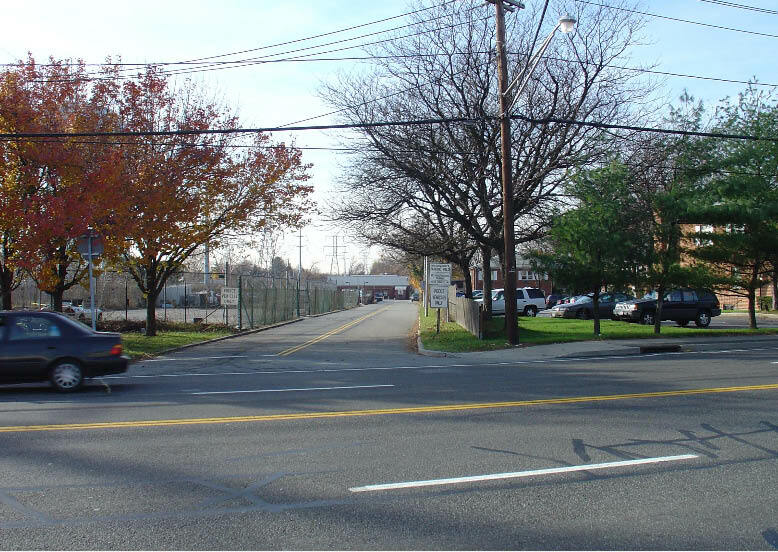 The right-of-way of the Long Island Parkway has been repaved and now leads to the Nassau County Eighth Precint police station. Very nice presentation. The Belcher-Hyde map lets me see the part of the parkway that I used to hike on when I was a kid in the early 1950’s, living in Plainedge/North Massapequa. Thanks! to be most specific. Is THAT the Nibbe bridge? These pictures are not all the same lodge and the map locations are not the Massapeque lodge. I lived there it was my Grandparents’ home and they worked for Vanderbilt until his death. I spoke to Athur today and we agree the photos are of the Massapequa Lodge.